Hello, all my fellow readers, book junkies, fans, and followers! I have great and exciting news! I have sweet talked some of my favorite authors into some free goodies just for you! I had promised an awesome giveaway earlier on Facebook for when I reached 300 Likes, BUT... the prizes were so overwhelmingly AWESOME,that I chose to take the goal to the next level and reach for 400 Facebook Likes in order to open the giveaway. Now, you might be asking yourself, how awesome are these prizes?? Well, let me see, I shall share what is in store for the winner, and then you tell me,by sharing and liking me all the way to 400! From Author +Connie Suttle; One "I heart Larentii" travel blanket, coffee mug, keychain, pen, retractable back scratcher, William Winkler 3x5 note pad and a spiral bound note book with pen. 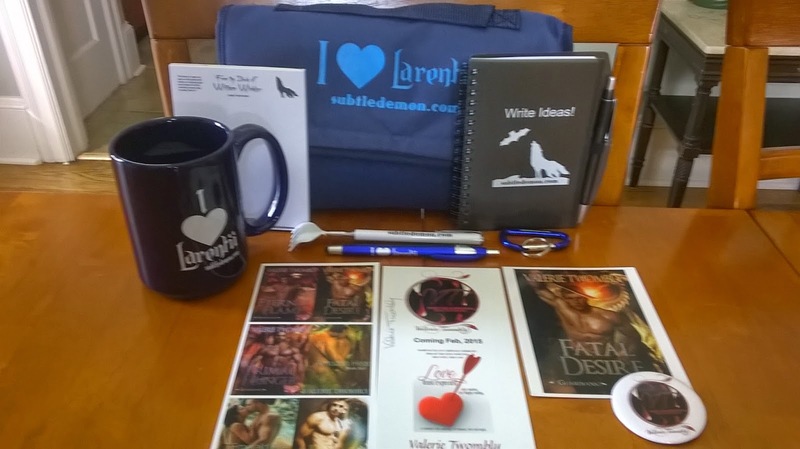 copy of one Secrets of Stone book (readers choice) and a swag pack. From Author +Renea Mason; One E-book from the Symphony of Light series (readers choice). From +Valerie Twombly; One signed bookmark, one unsigned postcard and one pin button. From +Kim Harrison; One signed postcard. NOTE: Not all prizes are pictured. Some prizes will be sent separately from the authors directly. This giveaway prize is for ONE winner only. US residents only please. As soon as our 400 Likes goal is met, I will announce the giveaway open and the rafflecopter will be posted here on my blog. So good luck, and happy SHARING people!!! !